Busch grabbed his third Cup win of the season, eighth overall at Bristol, and 10th this year spanning all three of NASCAR’s national series. He beat his older brother, who said if given the chance in Sunday’s race, he’d have wrecked him so that Kurt Busch was the one celebrating in victory lane. The Busch brothers lined up side-by-side on the final restart, but Kurt Busch had nothing to slow Kyle Busch’s steamrolling of the competition this year. 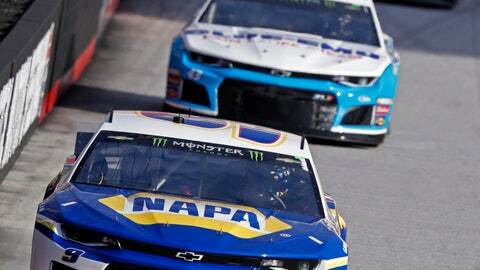 They’d inherited the lead as the first in line not to pit for tires during the 11th caution, and it set up a final shootout between Bristol’s two winningest active drivers. Kurt Busch is a six-time winner at the .533-mile high-banked oval and lamented the loss over the P.A. system. When he said he would have wrecked Kyle Busch, the crowd roared and affirmed Kurt Busch’s frustration with the final results. He’s emerged as the top driver in the winless Chevrolet camp with seven finishes of 12th or higher in his debut with Chip Ganassi Racing. The wins go to Kyle Busch, seemingly all the time this season, in anything he drives. Along with teammate Denny Hamlin, they’ve given Joe Gibbs Racing five wins through the first eight races. If a Gibbs car doesn’t win, then a Ford from Team Penske has, and that organization has the other three Cup victories this year. The pit strategy set up the storybook final ending to a weekend spent honoring Hall of Famer Darrell Waltrip, the all-time winningest driver at Bristol with 12 victories. He used this venue to announce he’ll retire as Fox Sports’ lead analyst after 19 seasons, and his success at making the concrete jungle his playground was celebrated as Waltrip waved the green flag to start the race. Waltrip also was wired by the network to give his trademark “Boogity! Boogity! Boogity! Let’s go racing, boys!” call from the flagstand. Because what was once Waltrip’s domain now belongs to Kyle Busch, and not much can stop him these days, especially at Bristol. “It ain’t 12, that’s for sure. So I got more to go. We’re getting there,” Kyle Busch said.